Like anyone else, we judge ourselves by our peers. And like the rest of the world, most creatives only share our success and rarely our failure. As a result we’ve become scared of failure. That fear breeds common reactions: self-doubt, depression, and even the self-loathing as shown in panel three. 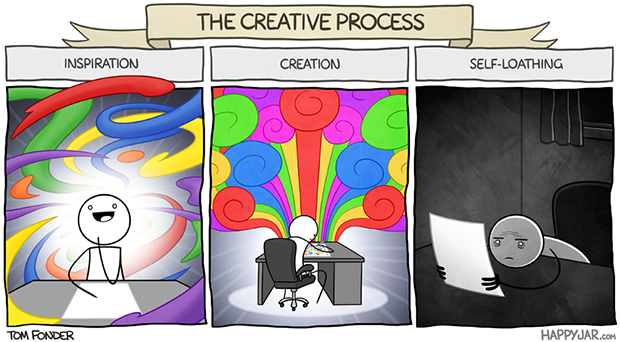 Often, because of those common reactions, creatives just give up. We should do the exact opposite. Let’s go back and read that again: common reactions? Yes. Common. It happens to everyone! You’re not alone. I’m right there with you. We all deal with this! But these aren’t insurmountable hurdles. These struggles are only permanent if we let them abide. The only way to really fail is to stop. The important thing when confronting these barricades is to press past them. We get so close to our work all we see are the mistakes, the errors, and the things we want to change. We no longer see the good, but it’s there. That’s why it’s important to move past these biases, ignore the demons of self-doubt, and get the work out there. Let the world decide. Push yourself and move on to your next project. As I said earlier, so many of us hit that third panel and just… stop. Which is the wrong reaction. You see, the only way to really fail is to stop. So yeah, as I said, Happy Jar got me thinking. You can see more great (and thought-provoking) comics at HappyJar.com. It’s updated every Tuesday and Friday. Subscribe to the RSS feed here, or follow HappyJar on Twitter. It’s great stuff and I highly recommend following along. Yeah, panel three was pretty much how I was feeling today. So, thanks.